Wed., March 8, 2017, 3:01 p.m.
BARCELONA, Spain – Barcelona needed a miracle to make history Wednesday. Three, to be precise. Just minutes away from elimination, Barcelona had to conjure up three instant goals and it was Neymar who stepped up. 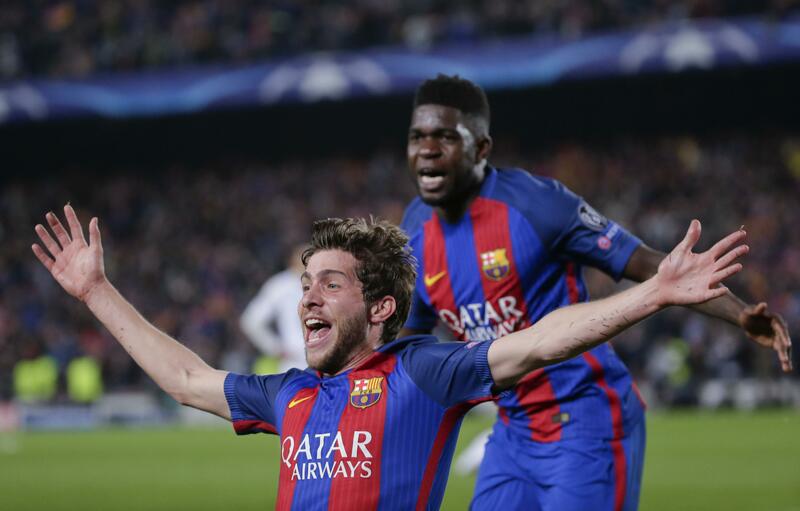 The Brazilian striker first scored from a free kick in the 88th minute then a penalty two minutes later before floating a perfect pass for Sergi Roberto to score the dramatic winner in the fifth minute of injury time as Barcelona beat Paris Saint-Germain 6-1 to complete the biggest ever comeback in the Champions League. Roberto’s strike gave his team a 6-5 victory on aggregate, making Barcelona the first side to overturn a 4-0 first-leg defeat since the current format started in the 1992-93 season. PSG seemed certain to go through after Edinson Cavani scored a valuable away goal following Barcelona’s opening salvo of three goals, which included a Lionel Messi penalty, before Neymar turned it all around. “This is the best match of my career,” Neymar said. “It was difficult after the match in Paris. For the past week I have been crazy to play this match, and we have made history. The winner sent Barcelona’s bench flooding onto the pitch as the stadium celebrated the club’s 10th consecutive appearance in the quarterfinals. Coach Luis Enrique, who announced he would leave the club this summer, embraced Neymar and any other player or staff member within reach. PSG coach Unai Emery’s strategy of not pressuring Barcelona backfired, as his team sat back and passively let the hosts hem them into their box. The visitors’ entire backline was frozen when Rafinha’s routine cross came into the box in the third minute, and Luis Suarez was able to nod a bouncing ball over goalkeeper Kevin Trapp. Defender Layvin Kurzawa was at fault for Barcelona’s second goal in the 40th, when he turned Andres Iniesta’s back-heeled flick into his own net, delighting the 96,000-plus crowd. Another PSG defender, right back Thomas Meunier, was the culprit behind Messi’s penalty in the 50th after he clumsily thrust his shoulder into Neymar’s legs while trying to recover his position in the box. Emery finally ordered his players briefly forward and Cavani responded for the French champions, rifling in Kurzawa’s headed pass in the 62nd moments after he had hit the post in the visitors’ only threats. But Barcelona continued to press forward with Neymar leading the way. He struck first with a curling free kick from the left flank that slipped inside Trapp’s near post. Next, he took responsibility for converting the spot kick after Suarez was shouldered down by Marquinhos in the box. The best was saved for last, when his pass was lofted over the defense and fell for Roberto to stretch out far enough and turn the ball into the net. It was a demoralizing end for PSG. The French side was on the verge of avenging quarterfinal exits to Barcelona in 2013 and 2015 and earning an elusive marquee victory that its Qatari owners were longing for. “Three weeks after winning 4-0, we lose 6-1. That’s very, very hard to accept,” said PSG president Nasser Al-Khelaifi. The draw for the quarterfinals will be held in Nyon, Switzerland on March 17. Published: March 8, 2017, 3:01 p.m.